The shape is unfamiliar to anyone coming from an ergo righty Logitech or Razer mouse, but once accustomed the Rival 600 controls fantastically. The Rival 600 can be had often for under 70 bucks, and for that price the value puts it ahead of its competitors given how much there is to this mouse. The Rival 600 is just a solid all arounder for a upper mid-range price. If you have large hands and you like this shape then there’s nothing to dislike about the Rival 600, great buttons, flawless sensor and a soft cable. 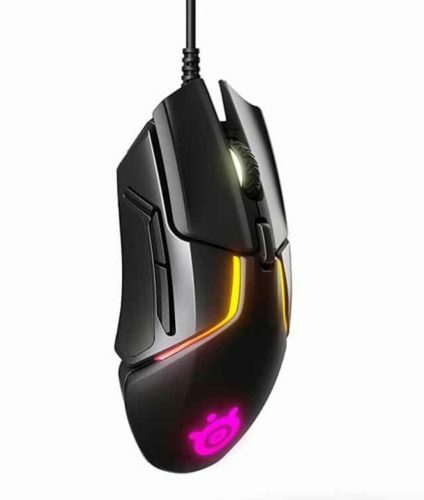 The Rival 600 is a medium/large mouse with a long length, compared to the G703, the Rival has a shorter hump making it lean more towards a claw and fingertip grip, that being said, playing in palm grip was doable, it just took a bit longer to get used to for me. This mouse is longer than the G703 with a lower middle hump, with a slightly slimmer width. The side grips are coated with grippy rubber to assist in mouse pick up, which is required, the Rival 600 sides are slightly curved but not to the extent of some other mice, I’ve noticed have to grip a little hard to pick up the mouse compared to some other mice, but it’s nothing major. The top of the mouse is coated in a black soft touch material, the mouse feels premium, the coating doesn’t seem to attract fingerprints and feels good in the hand despite some intensely sweaty gaming sessions (damn you summer). 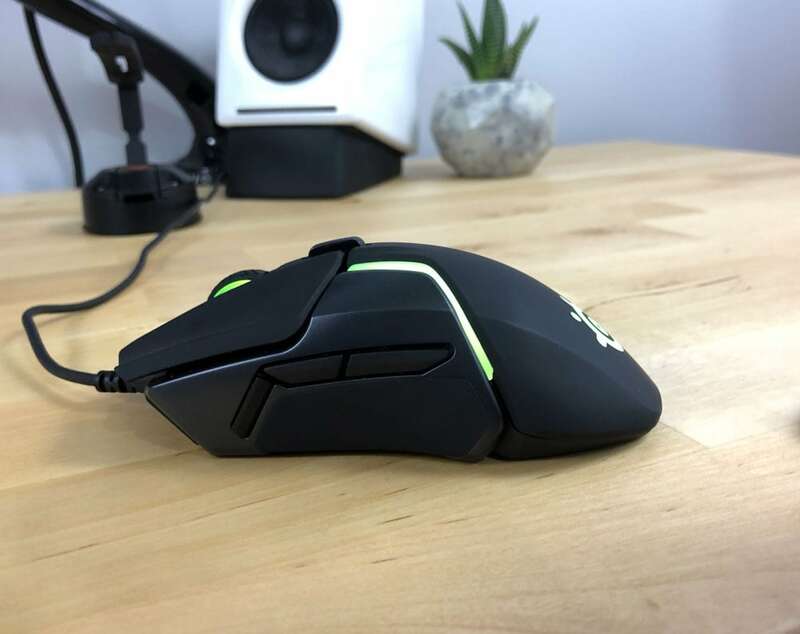 The Rival 600 shows no obvious rattles or creaks when tapped or shaken, the scroll wheel is firmly place as well showing no rattle. On the bottom of the mouse you’ll find 3 feet, 1 large pad in the front and two in the back, the feet perform well providing smooth glide even on a control Zowie G-SR pad. The Rival 600 weighs in at 96 grams without weights, not the lightest mouse available but pretty good for a larger size mouse. 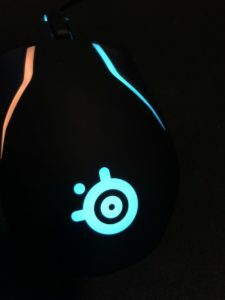 The mouse packs a Steelseries proprietary TrueMove 3 Optical Gaming Sensor, which is still a Pixart sensor, that performs similarly to the flawless PMW3360, the TrueMove version however has a larger effective DPI range for input, with less jitter. All of this means that this mouse will perform at high DPIs, so if you love high DPIs this mouse might be for you. The Steelseries Rival 600 actually packs a second sensor that helps the mouse detects the depth of a surface for better lift off distance accuracy. 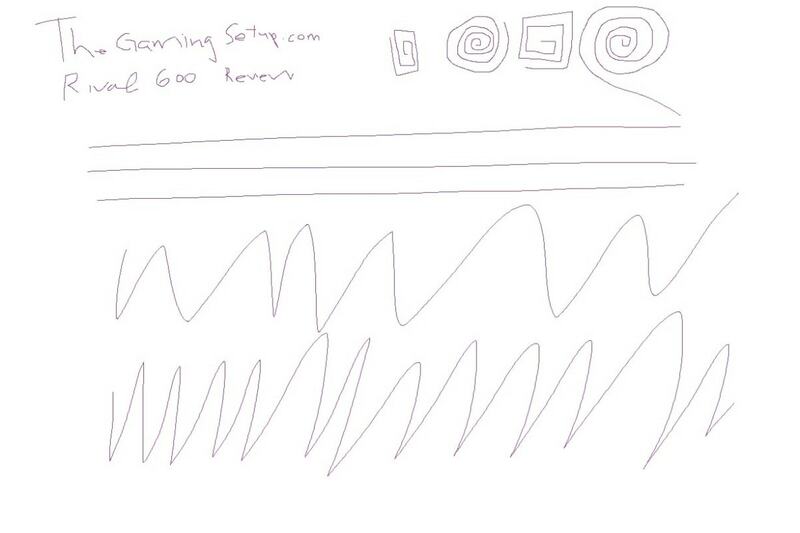 It’s a great bonus feature and we applaud Steelseries for trying to innovate in mouse design. It’s hard to tell the impact of the second sensor in real world scenarios, I haven’t had any issues with lift off distance tracking in other top tier mice. The rubber cord is light and flexible, thin enough to fit all mouse bungees, I don’t really feel any drag or bunch when playing with this mouse. Overall, the Steelseries Rival 600 is a performer, combining a great shape, flawless sensors and a reasonably light weight, I haven’t had any issues performing in high twitch games like Overwatch or tracking long distance opponents in games like Fortnite. 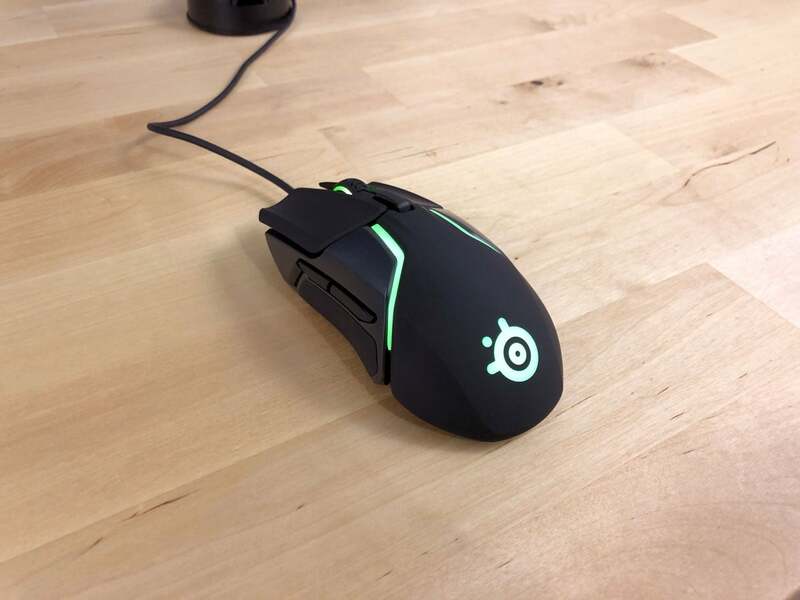 The Rival 600 has 6 buttons with 1 dpi switch button that can be mapped to other functions. The 3 side buttons only live on the left side of the mouse, this mouse is made for right handers. The 3rd side button is located in front of the side buttons and can be programmed to execute macros, toggle DPI or whatever you wish, the placement of the button is a little awkward though considering how long the mouse is, I didn’t get any use out of it. The clicks on this mouse are a dream, super tactile, not too soft, not too stiff with a satisfying consistent response on both the left and right buttons. The only other mouse that has clicks as good as the Rival 600 are the Logitech G Pro/G305s. The button switches seem to be Steelseries own brandm, rated for 60 million clicks which is more 10 million clicks more durable than a standard Omron switch, I’m a major fan. The clicks on the non primary buttons are good, the scroll wheel clicks solidly with great tactile feedback. The scroll steps are distinct and provide good response while producing minimal noise. The side buttons have thin profile, but are and separated enough from each other that I didn’t have any problems locating and distinguishing the side buttons from each other. The Steelseries software Game Engine is fairly robust, it’s as good as Logitech’s software for functionality but I think it actually does a better job of being a lightweight application and having more intuitive UX. The RGB on the Rival 600 is the best we’ve come across, with multiple individual zones, you’re allowed to do a lot of funky combinations on top of the standard colour wave settings. The Rival 600 also has an onboard memory chip allowing for all illumination profiles and settings to be saved on the mouse. Steelseries has packed a lot of very nice to haves like the lift off sensor, onboard memory and a best-in-class RGB for a very reasonable price. Your warranty will only cover manufacturing defects. It does not cover regular wear and tear, including but not limited to, breakage due to abuse, cosmetic damage, dents and chips, improper usage, water damage, or other causes attributable to events outside the manufacturing process. US and Asia: 1 year warranty on all products. EU: 2 year warranty on all products. All products are covered by local warranty regulations. Looking around the internet for issues, the most common complaint is that the silicon grips are poorly glued on, Steelseries will replace the mouse if that becomes an issue, the grips on the mouse that we purchased are stuck on there really good. Update #2: Steelseries has honoured their warranty and sent replacement side panels, so far the glue on them has been solid. While wireless gaming mice are getting really good, they come at a much higher cost, for our dollar, the Rival 600 performs just as well any of those mice. If you have a medium to large right hand, prefer to play in claw or fingertip grip, give this mouse a look, no question. For people outside of those parameters, this mouse is still very solid, it doesn’t have any awkward length issues like the G903 because it’s still a great ergonomic shape.